Welcome to DK Barrel Company! 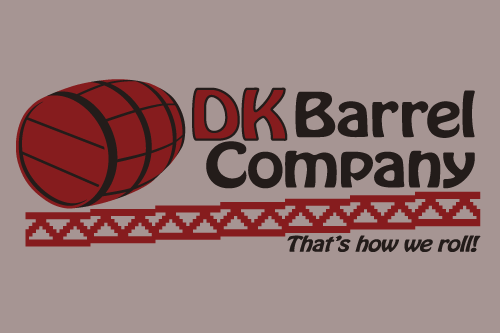 By now you have received your company-issued DK Barrel employee T-shirt. This boxwood plank-colored uniform sports our timeless logo and signature catchphrase, “That’s how we roll!” In this introductory training session, we’ll explain how to jump the hurdles of failure and climb the ladder to success. At DK Barrel Company, we know that the modern drum-and-cask industry is ever evolving and fiercely competitive. That’s why we commit ourselves to more than just the manufacture of fine firkins and butts. We also take pride in shaping applicants such as yourself into our company’s most valuable asset: the cooper. Coopers are sometimes thought of as barrel makers, but this description fails to capture the versatility required of 21st century cooperage. Present-day coopers have earned the nickname “jump-men” for the many hoops, both literal and figurative, that they must jump through when creating a barrel. The contemporary cooper is responsible for fabricating casks of all shapes and sizes, from puncheons and rundlets to kilderkins and tierces. We know this industrial jargon may seem a bit overwhelming right now, but not to worry. In the next few weeks, you’ll participate in seminars and on-site exercises covering ladder fundamentals, intermediate malletry, and primate relations. But we’ll save those discussions for future sessions. Right now, sit back and relax as we spend the next two hours exploring the expansive and surprisingly complex history of the humble barrel. Wear this shirt: while challenging Billy Mitchell or hanging with Mr. Cooper. Buy this shirt for: your local carpenter-plumber, his girlfriend Pauline, or a damned dirty ape. This shirt goes well with: red overalls, red hats, blue mustaches. Don't get it?A cooper makes barrels and a gorilla destroys them. This startling video documents their eternal struggle.